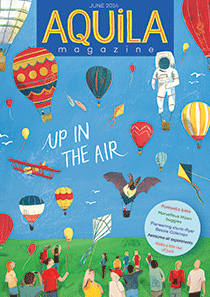 Aquila Magazine (for children aged 7-12) – June 2014. Original article. Where does the internet live? What is the internet? We could compare it to a giant library, except we can get to any page in any book immediately. Or we could compare it to a post office, except letters are delivered right away. It’s a shop too – we can buy pretty much anything we want from almost anywhere in the world, and it will be delivered to our homes a couple of days later. And lately the internet has been turning into a great big playground, where we can talk to each other, play games, look at pictures together, and learn about life in other countries by talking to people who live there. We can see all these things on our computer screens, but that’s just a window into the vast global network that makes up the internet. So where exactly is the internet? What does the internet actually look like? If you have seen the insides of a computer, or even a simpler electronic device put together with lots of wires and chips, this will give you an idea what the internet looks like. Except, of course, the internet is a lot bigger and much more complicated. Just like we have bookshelves for storing books, all the websites with all the photos, text and videos need to be stored somewhere too. The internet is stored in massive stacks of electronic memory boards and magnetic discs, located in big buildings called datacentres. These are placed all over the world and look pretty boring: just rows and rows of cupboards, linked by millions of wires. Websites have to pay rent for the space they use in a datacentre, and the more space they need the more it costs. This is because datacentres run on electricity, they generate a lot of heat so they need cooling down, and they need to be kept secure so no one can break in and steal the data. Avoiding “blackouts”, which would mean people can’t get to websites, is incredibly important for datacentres, so they need backup solutions in the event of equipment failure or power cuts. The data that makes up the internet is led away from the datacentres by cables that go into the ground, and we can access these in our houses by hooking up them like we do with electricity and water. The cables that transport the internet are made from fibre-optics, which mean they work by light pulsing through bundles of many tiny cables, each the width of a human hair. This is faster than metal wires over longer distances, which is important when considering that internet cables also run between continents, buried at the bottom of the ocean. Today’s fibre-optic cables are a big improvement from the first transatlantic cable, which was a copper wire laid in 1858. The first message was sent from the US president to Britain’s Queen Victoria, and it took 17 hours to come through. This was pretty good at the time, considering the alternative was sending a letter by boat. The US president called it “a triumph more glorious, because far more useful to mankind, than was ever won by conqueror on the field of battle”. A lot has improved since then, as data from a website in America or China now travels in the blink of an eye to load on a computer here in Britain. It’s even more impressive when we consider that the internet is often used without actually plugging a cable into the network. When we look at websites on mobile phones, the data is coming in wirelessly through the phone network. Wireless internet, or WiFi, is popular in homes as well as cafes, as it lets us connect many mobiles, laptops and tablet computers to the network without cables. WiFi works by taking a signal that comes in through a cable, and converting it to a radio signal for devices can tap into. On a big scale, a similar method lets us use internet satellites to get internet connections out to remote areas, or to ships at sea. Over shorter distances, Bluetooth technology lets us send data without a cable by creating a mini network between two devices, so we can do things like sending a photo from a computer to a printer. More and more devices are being networked so we can control them from a distance, such as TVs, cars and refrigerators. It’s already possible to turn on the heating before we get home by sending a signal via the internet, because heaters are being installed with networked control panels. The internet was first invented in the 1960s by the US Defence Department, who called it ARPAnet. It became popular among universities who found it useful to be able to share data with other schools. Still, it wasn’t until 1991 that the internet as we know it now was born, when Englishman Tim Berners-Lee invented the World Wide Web. WWW became the common language for the whole internet, making it possible for anyone to access any page. Instead of just being for researchers or governments, Tim Berners-Lee wanted the internet to be a social medium, a place where everyone can share ideas with other people and work together. Posted on 06/01/2014 by Jess. 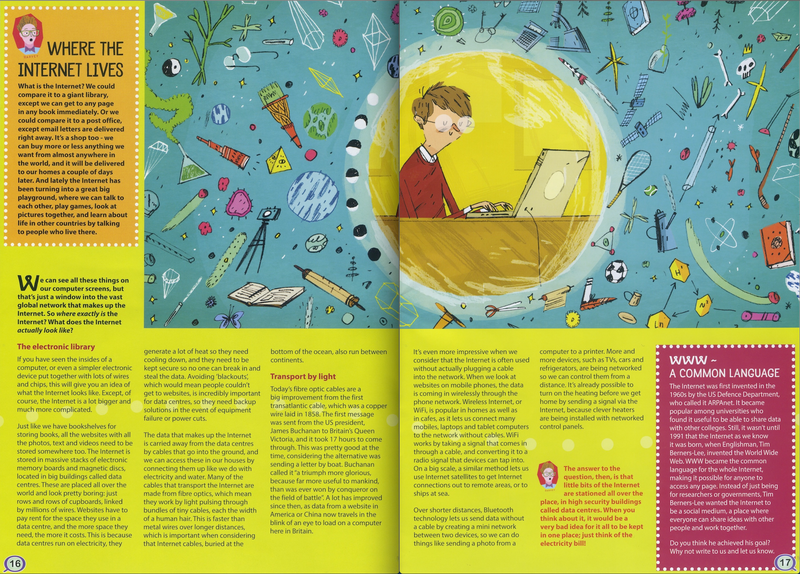 This entry was posted in Technology features and tagged aquila, children, internet, technology, www. Bookmark the permalink.